It looks likely that Glenn Irwin will be back at the North West 200 next month in the colours of Paul Bird Motorsport's Be Wiser Ducati team. It is understood the team are keen to return to the event, where they have enjoyed success in the past. Paul Bird Motorsport, for whom Irwin competes in the BSB series, have not confirmed their participation as obstacles have yet to be overcome. Irwin secured a podium place in the Supersports at the NW 200 in 2015. However, he indicated last year that he would not compete in road racing any more, citing his focus on forging a successful career in British Superbikes and the birth of his son as the main factors in his decision. "I am a road racer and it is great to have the opportunity to race in front of my home crowd again." said the 27-year-old. "I really want to do the North West again because I loved the place when I first raced there. It will be great for people to see a great bike like the Ducati in action too." Paul Bird Motorsport last competed at the North West in 2015, when they enjoyed podium finishes with Ian Hutchinson on board their Kawasaki machines. "The team's primary focus for 2017 with both Glenn Irwin and Shane Byrne is to retain their title in the MCE British Superbike Championship for Be Wiser Ducati and Ducati Corse," they said. "Paul Bird Motorsport have had lots of success at the North West 200 over the years, including podium finishes on their last visit in 2015, and the team is hoping for Glenn Irwin to participate at this year's event. "As with all factory-backed teams, various logistics and demographics have to be considered prior to taking on additional challenges such as the North West 200 and all parties are working towards having the Ducati Panigale R at this year's event." Irwin raced in the Macau Grand Prix in November but was forced to retire with mechanical problems while challenging for the lead. He has also competed at the Ulster Grand Prix, making his debut at Dundrod in 2014. 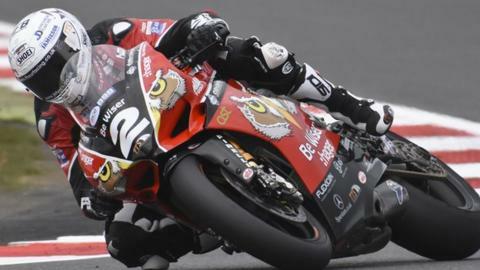 Irwin was third in the second race of the opening round of the 2017 British Superbikes Championship at Donington last weekend.